Photo: Taylor-Falls House, ca. 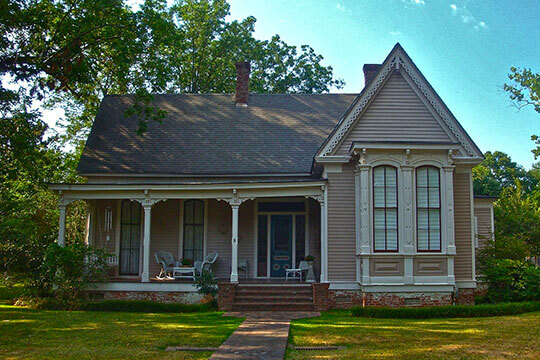 1885, Pointer Avenue, Como, MS. The house was designed and built by Swedish architect, Andrew Johnson. Listed on the National Register of Historic Places in 1984. Photographed by User:Tommycie (own work), 2012, [cc-by-3.0 (creativecommons.org/licenses/by/3.0)], via Wikimedia Commons, accessed September, 2014. Panola County is divided into 2 judicial districts, with Batesville serving as the seat of the First Judicial District and Sardis as the seat for the Second Judicial District. District 2 county administrative offices are located at 151 Public Square, Batesville, MS 38606; phone: 662-563-6200. District 1 county administrative offices are located at 215 South Pocahontas Street, Sardis, MS 38666; phone: 662-487-2070. According to historian George M. Moreland in his article, Birth of the Area, A Story in Progress, a meeting took place around a spring formed by headwaters of Pontotoc Creek and Chiwappa Creek in 1832. Five commissioners appointed by President Andrew Jackson met with chiefs and leading tribesmen of the Chickasaw nation. A treaty known as the Treaty of Pontotoc Creek was signed that ceded all lands owned by the Chickasaws in Mississippi to the white man and sent the Chickasaws west from the "land of hanging grapes" or Pontotoc. As a result of the treaty, the Mississippi Legislature formed twelve new counties in 1836 with Panola County being one of twelve. Several of the newly formed counties were given Indian names to honor the Chickasaws who had been peaceful during the settlement days and in abiding by the provisions of the treaty. The name Panola means, "cotton." Long before the treaty, white men had settled along the Tallahatchie River ("rock river") establishing the river port known as Panola or Panola Landing. Early settlers of Anglo Saxon stock had come to the area from North Carolina during the movement west by pioneers looking for good land for farms and timber for houses. The area had provided both with rivers, springs, fertile soil and virgin forests. Bounded on the north by Tate County, on the east by Lafayette, the south by Tallahatchie and Yalobusha, and the west by Quitman, the county has a land surface of 699 square miles, and the original area assigned 21 townships comprising 756 square miles. Quitman County gave a fraction of land to complete the needed acreage. The region was described as a healthful, well-watered, prosperous region. Judith Holland and P Ana Gordon, Historian, Mississippi Department of Archives and History, The Architecture of Andrew Johnson in North Mississippi, nomination document, 1983, National Park Service, National Register of Historic Places, Washington, D.C.
Letitia Parham Wright, Batesville Historic District, Panola County, MS, nomination document, 2003, National Park Service, National Register of Historic Places, Washington, D.C.